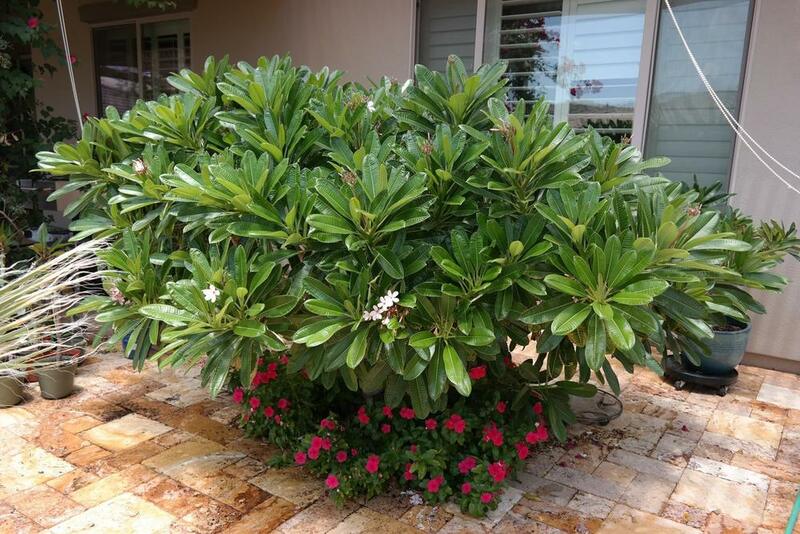 I bought my Dwarf Singapore Pink plumeria at the Boston Home & Garden Show around 2001 or 2002. It was the potted plant on display and my husband did some convincing, finally offering the grower $150 to reluctantly part with it. I wish I remembered who it was - I'd love to let them know I took good care of it! We lived in a condo in a Boston Harbor highrise and while it received a lot of light from a south-facing window wall, I only recall it blooming once in those years. In 2008, we drove cross-country to Arizona with it in the backseat. It remained in a pot until we had our back patio and ramada constructed. I had a custom cut-out with irrigation put in in front of our bedroom window just for this plant. Once it was put in the ground, what a transformation! I keep it well watered and feed it monthly alternating with Alaska fish fertilizer and Miracle-Gro Bloom Booster. 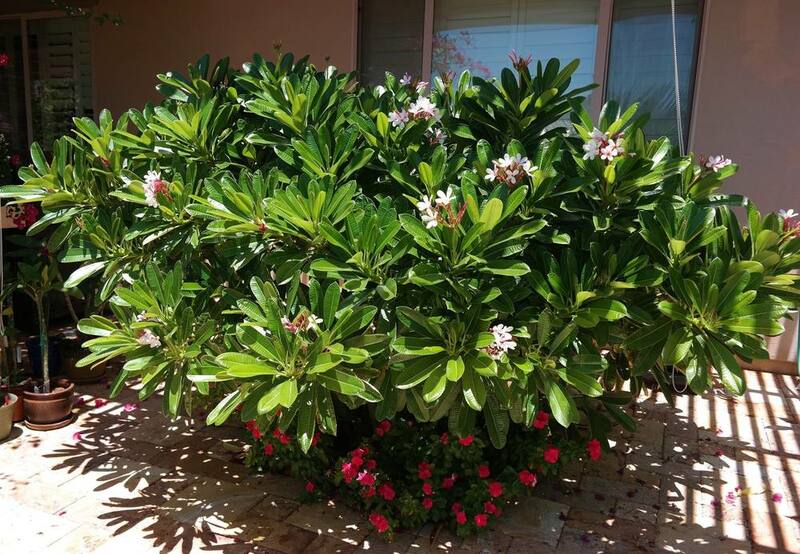 It's a prolific bloomer with classic frangipani scent. Like all plumeria, colors change according to heat and humidity. 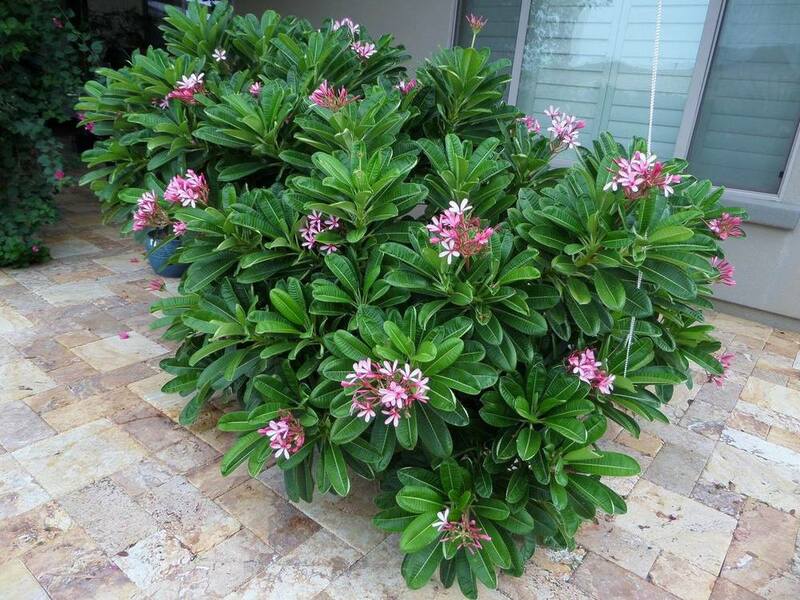 Dwarf Singapore Pink can bloom from a pale blush to darker pink.